The vinyl discography for Champion's Promises Kept is literally the reason why we want and need to include all of the information about every possible variant. So, *deep breath* the first set of test pressings was rejected, because the band decided that they weren't happy with the mix of the album. Since the plates were made, and to pay homage to the Judge "Chunk King" album session, the band decided to press the first mix on 150 copies of white vinyl, with blank white hand stamped center labels. Screen printed jackets were made for the bands record release, but collectors should note that of the 150 covers, the first 51 include the Bridge Nine logo on the back, while the remaining 99 do not, because the logo became blocked during the printing process. 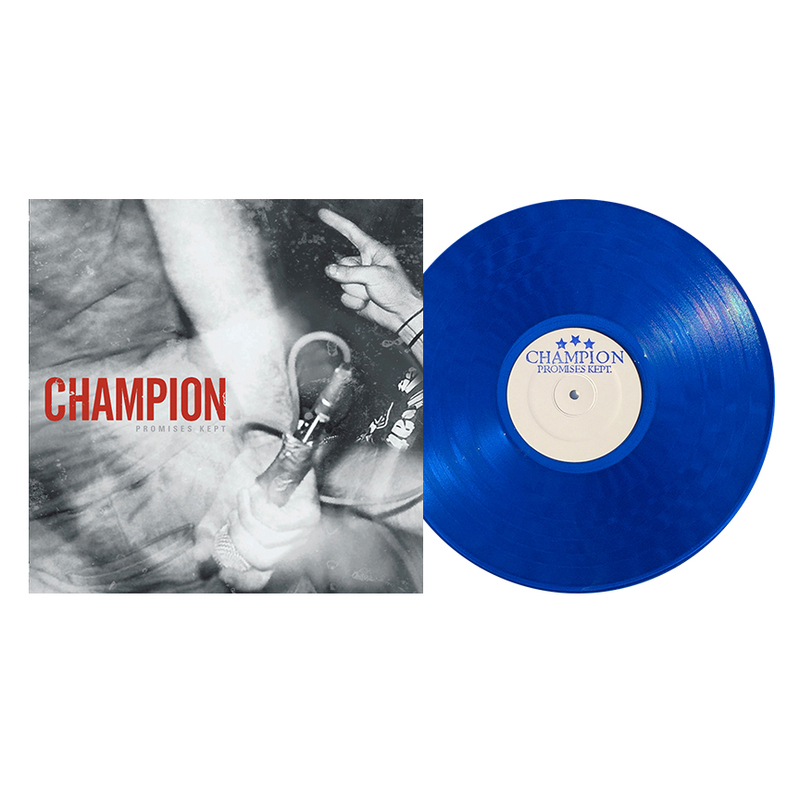 A second set of test pressings were ordered and approved, and 3 more colorways were made, including a 220 piece translucent blue tour press with blank white center labels and "Champion Promises Kept" printed on them with a custom made blue rubber stamp. This album was also licensed to the UK label Dead & Gone for release as an LP in the UK/Europe, and Refuse Records released a full version on cassette, mostly for distribution in Eastern Europe where cassette sales were more prevalent at the time. Sometime after the band had already broken up, Bridge Nine took the remaining overrun of raw vinyl that did not have accompanying covers, and created a "Warehouse Edition" of a couple of the colorways available. Over the next couple of years, the band decided that they were STILL not happy with the mix of the album. So, a 3rd mix was done, with Aram working on it at the God City studio with producer Kurt Ballou. This final mix was released on vinyl in 2011, when Promises Kept was re-issued as a new pressing on three different colorways, housed in an expanded gatefold LP jacket for the first time.